Niankoro, un jeune homme entreprend un long parcours initiatique qui doit lui donner les pouvoirs magiques que Soma, son père, détient jalousement. Mali / Burkina Faso / France / Allemagne de l’Ouest, 1987 | 1h44m | 35mm, en couleur | Bambara sous-titré français. Compositeurs de la Musique : Michel Portal, Salif Keita. This adaptation of an ancient oral legend from Mali, is one the most acclaimed and widely seen African films ever made and is as visually stunning as anything from Hollywood. Set in 13th century Mali, it follows a young man on a quest to escape a curse his own father has put on him. Along the way he learns about honour and true power. Cissé’s extraordinary use of landscapes and light produces a unique and striking cinematic style. 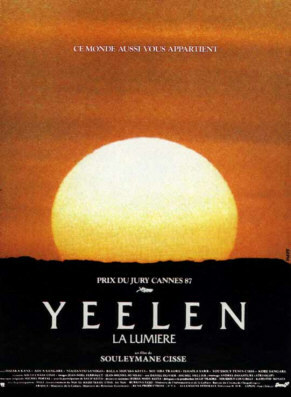 Father against son, white magic against sorcery, selfishness against altruism – Yeelen has all of these, plus some of the most stupendous cinematography of African landscapes you could ever wish for. Soaked in the metaphysics of Bambara cosmogony, it depicts the story of Niankoro as he is hounded by his’poisonous’ father, Soma. During his travels, Niankoro saves a village and gains a wife, but finally has to face the force of his father. The final showdown between father and son provides a dramatic end and a new beginning. Music: Michel Portal, Salif Keita. In color; running time: 106 minutes, English version 104 minutes; length: 9,401 feet. Released 1987.